Trinity College’s Science for the Greater Good series, now in its fifth year, recently welcomed its latest alumnus speaker, Stuart Koman ’76, the founding president and CEO of Waltham, Massachusetts-based Walden Behavioral Care, Inc. During his October 12 Common Hour talk, Koman expressed the importance of speaking with a younger generation about current issues in society in order to overcome detrimental mental illnesses. “You are important. You are critical. You are the energy and new ideas of this generation,” Koman said. Alison J. Draper, director of Trinity’s Science Center, oversees the Science for the Greater Good series, which began in 2013. “The series brings to campus Trinity science alumni who talk about their impressive career accomplishments and about how their work connects to the greater good—however they define it,” said Draper. Koman began his professional career in 1985 as director of adolescent programs at Charles River Hospital in Wellesley, Massachusetts. He then co-founded Choate Health Systems, Inc. to provide behavioral health care and treatment services. From 1992 to 2000, he served on the board of the American Psychological Association’s practice division. In 1995, he started Koman Associates, which focuses on leaders and leadership issues in government, healthcare, and business. He also serves as an adviser to state agencies throughout the United States. He earned his B.S. in psychology from Trinity and his Ph.D. in clinical psychology from Duke University. 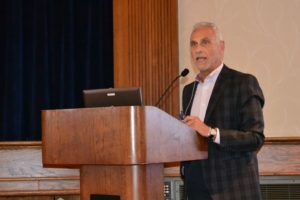 On the younger end of the age spectrum, Koman said, “social media is the main component of eating disorders at younger ages.” He spoke of the prevalence among the younger generation of the desire to modify their appearance in order to achieve the “ideal” body type by Photoshopping photos or dieting to an unrealistic standard. “Genetics load the gun, and the environment pulls the trigger,” he said. Koman shared an example of a young woman named Sandy to explain how environment can make a big difference in treatment. Koman said Sandy sought treatment from Walden Behavioral Care after four years of prior treatment at several other facilities. “She worked with Walden for quite a while and they couldn’t seem to find a way to help her become healthy,” said Koman. “We found that part of the problem was the treatment itself. She had lost motivation to become healthy again because she forgot life was about more than treatment.” The doctors agreed that Sandy should be sent home for periods of time and go back and forth between home and treatments to try to regain a normal life. Over time, Sandy gained back her health, graduated from high school and attended college, said Koman. Koman noted that anorexia, bulimia, and binge eating are three of the most common, life-threatening illnesses and 30 million Americans experience one of them in their lifetime. “Most people don’t understand that these are life and death situations,” Koman said. He said that Walden Behavioral Care works to customize treatments for individuals to overcome these illnesses.